The tidewater goby is only a couple of inches long. And its mating rituals are the opposite of most fish. The male digs a burrow to house the eggs, then is “courted” by females, who exhibit colorful displays to attract potential mates. The fish inhabit lagoons and brackish estuaries up and down the California coastline. They prefer lagoons that get cut off from the open ocean for part of the year. That provides protection against storms and floods, which might wash them out to sea. And they’re pretty resilient; they can handle big differences in temperature and salinity, and the population can rebound in a hurry if there are major problems. 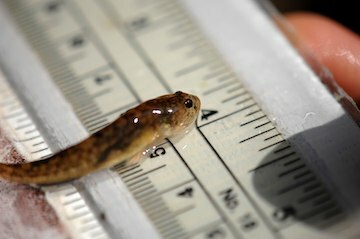 Until a few years ago, scientists thought all of the California fish belonged to a species known as the northern tidewater goby. But recent studies demonstrated that groups found south of about Los Angeles are different -- the southern tidewater goby. There are some differences in their fins, and in the organs they use to sense their surroundings. The number of these fish is dwindling, though. In 1980, the southern species was recorded at nine different sites. Today, it’s found at only three. Other habitats have been damaged by marina construction, invasive species, and even efforts to restore lagoons. So it’ll take some work to keep the southern tidewater goby from disappearing.